The Game of Thrones slot by Microgaming is an online slot in two different variations. You can play the five reels slot with 15 paylines or 243 ways to win. The slot is based on the eponymous and globally successful series by HBO. Game of Thrones is all about the Free Spins feature, because there are several additional bonus features which we explain below. The minimum bet is 15p (30p for the ways to win variant). The maximum bet is £3 (and £6 for the ways to win). The game is compatible with mobile devices and desktop computers. Symbols & Payouts: The symbols are graphically beautifully designed and are easy to learn. There are four playing cards symbols and some themed symbols. In the payline variant of the Game of Thrones slot you get up to 100x your line bet with these symbols. The other symbols are the emblems of the 4 different royal houses from the series. You can win up to 600x your line bet with these symbols in the base game. The Game of Thrones icon is the Wild symbol and the Scatter symbol triggers your Free Spins. 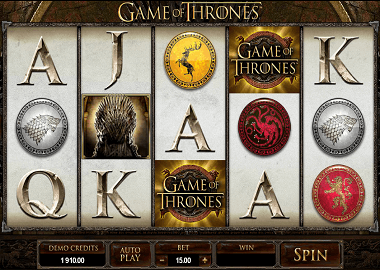 Stacked Wilds and Multipliers: The Games of Thrones slot is also relatively entertaining in the base game, because of the game’s Wild Symbol. This is the Game of Thrones icon which lands on your reels and it can appear as full reel wild and cover entire reels. In the four different Free Spins features you are able to win higher prizes with combination with multipliers. For big winnings you have to trigger one of the Free Spins feature. Only then can you win the Top Prize of up to £750,000. Free Spins feature: There are four different Free Spins features: Baratheon, Lannister, Stark and Targaryen. You trigger the feature with three scatter symbols and besides that has each of the four features its own number of Free Spins and Multipliers. With the Baratheon feature, there are 8 free spins with a 5x multiplier and the Lannister feature 10 free spins with a 4x multiplier. The Stark Free Spins feature gives you 14 Free Spins with a 3x Multiplier and 18 Free Spins plus a 2x Multiplier with the Targaryen Free Spins feature. Each of the features you can extend with three additional scatter symbols. The Top Prize is 20,250x your stake and will give you an awesome win. Microgaming slots are very common in online casinos and therefore very popular among players. The Game of Thrones Slot is one of the most popular slots because of the great success of the series. You can test the slot for free here (click on the banner above). More free Microgaming Slots can be found here on the Microgaming review page. Recommended casinos for UK Players can you find in the table below. At Energy Casino and LVbet Casino, you can now redeem a no-deposit Free Spins Bonus. Just register your player account and play for free.